must. admit. i am a sucker for skin care items. i dunno why but i just keep on buying skin care products. i am always on the look out for products that would work with my skin. unfortunately, my skin would easily get immune after some time. ever since i really got into makeup, i've been buying a lot of facial cleansers. i have brands like Shu, MAC, Fasio, even Elianto, etc. of course, my aim is to be able to find something that works at a cheaper price. and since i also put on makeup on other people, i always make sure i have a makeup remover inside my traincase just in case they would want to have their makeup removed after. so during one of my trips to Watsons, i passed by the PAC counter and checked out some makeups. 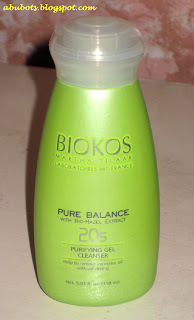 i got curious about their BIOKOS skin care items. They have a lot of range, from whitening to anti-wrinkle, etc. 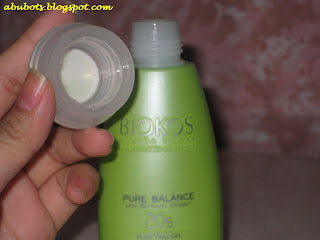 Having an uber oily skin, i had my eyes on their Pure Balance line...which caters to those with oily skins. i still have a toner that works wonder on me and day/night moisturizer so i decided to get their cleanser instead. 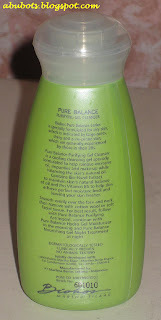 Pure Balance Purifying Gel Cleanser is a cooling cleansing gel specially formulated to remove excessive oil, impurities and makeup while balancing the skin's natural oils. contains Bio-Hazel extract to maintain skin's natural balance of oil and Pro-Vitamin B5 to help skin achieve perfect moisture level and leaving your skin fresher. what i love: it's cheap, priced at Php280 for 150ml. some might say it's expensive as compared to other brands but what i really like about this is that you don't need to rinse it off. yep, for those who are really lazy to do the entire cleansing routine...this is for you. i use it by smoothing the gel evenly all over my face (by the way, a little goes a long way) and then remove with cotton or facial tissue. i find it sticky at first...that i initially thought that i would need to wash it off still, but instead of going to the bathroom to wash, i turned on my laptop and surfed. LOL...after a few minutes, i then decided to wash it off but to my surprise, it's no longer sticky. my skin is left clean, smooth and kinda radiant (maybe because of the shimmers?). but i still had to wash it off...hehee, it's just me. i am such a retard like that. but for those who are on the go and just want to cleanse their face, this is one good product i can recommend. will i repurchase? yes..yes..yes.. this is definitely one product i'd always have in my traincase for my gigs. just this and some facial tissue/cotton, the models can have their faces cleansed in no time. IAMSUTIL gives this product 4 out of 5 stars!!! is this more facial cleaner than makeup remover? or both? i'm looking for a great makeup remover kasi.